Jeff's Side - "I jumped off a cliff. I had never visited Traverse City prior to moving, but knew a great opportunity at Right Brain Brewery awaited me. Upon arriving to my new home (from Los Angeles), my future head brewer and great friend Nick Panchame invited me out to The Little Fleet bar to hang out. 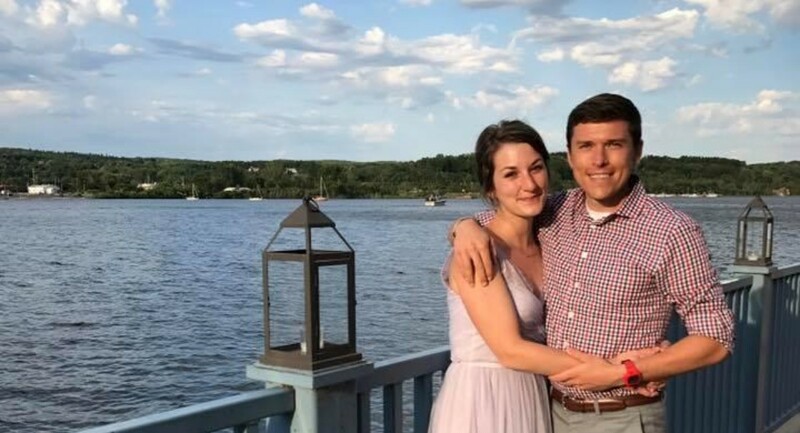 As any single man in a new city would do, I asked Nick and his then girlfriend Meg what girls were like in Traverse City. Knowing that I was very into running, Meg did not answer my question and said: "I'm going to have you meet my friend Jessie, she's amazing and a great runner." Two days later on a stormy evening, Meg invited me out to Northern Naturals Cider House to hang out and meet Jessie. Upon walking in, I discovered that it was Crafts night and I was the only guy in the whole place. I also saw a girl sitting with Meg who was way out of my league and that girl was Jessie! Immediately we hit it off and like any normal guy would do...I asked for her Dad's phone number before hers. After all, I needed to get on a hockey team and Wes Hernden was the leader of Traverse City's hockey scene! Somehow after this, Jessie still wanted to hang out with me and every time we got together it was more fun than the last time. So we started dating, and weeks later Jessie met my parents without her knowing she was going to beforehand. And yet...she still wanted to hang out with me. Jessie made me feel good about me. Everything was easy. Many road trips, concerts, running races, hockey games, and Tom Flannigans later, I couldn't take it any longer and decided to go for a run. On this run, I spelled out "Marry Me Jes" with a Garmin GPS map. I then waited for Jessie to run a 20-mile training run and showed her my GPS map. She said "YES!!!!" Ha! I got her...and in the best way I finally got her. I'm blessed to have a partner and best friend to marry. We get each other, we love each other, and most importantly we are able to deal with each other's quarks...at least I think she can deal with mine...Jes?" Jessie's Side - “My best friend Meg was pretty protective of me. She always looks out for her friends, so you can imagine my surprise when she wanted to set me up. She texts me about this guy she thinks would be perfect (why didn’t we save that text?!) and she plans a night for us all to meet for a drink… and crafts. It was the most frustrating craft project, way too tedious, I cut my finger, there was glue everywhere. And then he walked in. I remember his shoes, his outfit, the pins on his jacket, the way he nervously looked around. I remember thinking that he was way too handsome and cool for me, which almost relieved some stress, he would never go for a dork like me! After this craft night and a Southern Tier Pumpking Ale at 7 Monks, I started going to Right Brain Brewery more regularly, not just for Meg and I’s Tuesday night trivia but to hang out with a certain brewer. I still remember the canned pasta sauce over noodles you would eat after your shift, Jeff, and couldn’t wait to make you sauce from scratch. I was falling hard. It’s all a blur but we quickly began spending every moment together that we could, staying up until 4am just talking and learning about each other. This guy is so freaking cool. Fun runs, races, cooking together, exploring, traveling, moshing at punk shows… He convinced me that I could run more than three miles and to sign up for that half-marathon, then that marathon, and another. Jeff revealed a part of me I didn’t realize I had been suppressing. He helped me, still helps me, come alive. For the first time ever, I feel so comfortable around someone I can let my silliness come out. He loves when I get so excited, words turn to squeals or I have to dance it out. He challenges me to be better, to push harder. He embraces and soothes my anxieties. Jeff helped me find a self-confidence and strength I never knew existed. And he laughs at my jokes, guys. ALL of them! I’m not a person who believes in love at first sight, I don’t know if I believe we’re all on a predetermined path, but something that night, when I first laid eyes on Jeff, told me I was going to marry that man."